Fun-loving ‘madrileños’ know how to party like there’s no tomorrow and the Spanish capital is high in the ranks of European party capitals. Ginkgo Sky Bar, located on the 12th floor of the 5-star VP Plaza España Design, is one the city’s hottest new spots and promises one of the most glamorous New Year’s Eve events in the city. Offering the perfect vantage point to enjoy Madrid’s world-renowned firework displays, as well as panoramic views of the illuminated Royal Palace below, visitors can see in 2019 in a truly sophisticated Spanish fashion with a black-tie party until 4am with live music. An exquisite Spanish menu will include the ‘lucky grapes’ to enjoy the typical Spanish custom of consuming one grape on each of the twelve chimes of the clock at midnight. The menu includes starters such as Iberian ham with crystal bread, tomato and extra virgin olive oil, ‘Ginkgo style’ Spanish potato salad with prawn carpaccio and Bluefin tuna tartar with fried eggs and potatoes, mains such as Galician tenderloin with pistachio or Monkfish with a festive orange marinade, and desserts of Spanish nougat and Christmas sweets. Wines include Rioja Melquior Reserva de Autor (Tempranillo, 2005), Rias Baixes Gran Bazán Ambar (Albariño) and Le Veuve Clicquot Champagne. The New Year’s Eve party & dinner is priced at €240 (£214) per person or €110 (£99) for children below 12 and €150 (£134) for children from 12 to 15. To book a table call +34915 955 512 or contact the hotel via mail ginkgo@vphoteles.com. Double rooms are priced from €220 (£196) per night based on a room-only basis. For more information or to book, visit www.plazaespana-hotel.com/en . TENERIFE: ENJOY OLD HAVANA VIBES THIS NEW YEAR’S EVE AT HARD ROCK HOTEL TENERIFE! There’s still time to book an escape to the sun this New Year’s Eve and the five-star Hard Rock Hotel Tenerife is pulling out all the stops with a Cuban-themed 7-course gala dinner and party. Included with all stays booked over 31 December, the Old Havana theme New Year’s Eve party promises a legendary night inspired by the vintage Cuban capital. Guests can expect zesty Cuban & Caribbean flavours, bold colours and decor reflecting the country’s rich heritage and a night of Cuban-inspired salsa music. Guests can also enjoy the hotel’s panoramic Sky Bar offering some of the island’s best Atlantic views, three pools and ten exquisite bars and restaurants, including an Ibiza-style beach club. Jet2 Holidays (www.jet2holidays.com) has seven nights at the five-star Hard Rock Hotel Tenerife from £1419 per person departing on 26 December from London Stansted on a bed & breakfast basis, inclusive of flights and transfers. The ‘pretty island’ of La Palma offers holidaymakers an alternative festive experience this new year, with a VIP ‘Starparty’ offered by local stargazing company Ad Astra. Visitors can kick off the big night’s celebration watching the sunset, learning about the impressive night sky with a local astronomer and starlight guide, followed by a wine tasting showcasing renowned Palmeran wines. For the much-anticipated countdown, one of the best options is to join the locals in the heart of the city’s capital, Santa Cruz de La Palma, for a traditional Palmeran Verbena, held in the colourful Plaza de España. The Canarian equivalent of a street party, the cobbled streets are filled with the sounds of live orchestras playing Salsa and Merengue music until the early hours. Locals spend the night dancing and singing while indulging in delicacies sold at market stalls set up in the streets. 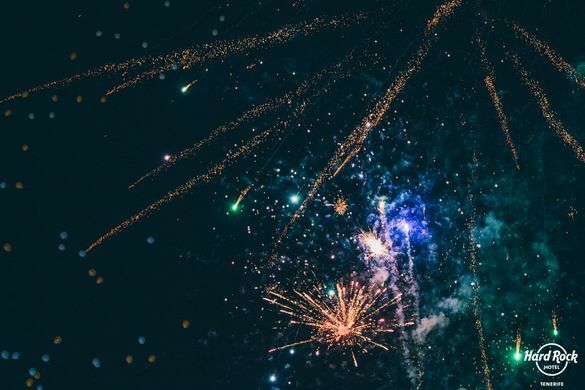 Close off the night with the traditional eating of the twelve grapes, whilst watching a magnificent firework display across the starry night sky. Stay at the Parador de la Palma (www.parador.es) boasting traditional island architecture. Double rooms are priced from €160 (£163) on a room-only basis. Palma, the capital of the Balearic Islands is the ideal destination for travellers of all-ages seeking to bring in the new year away from dreary British winter months. Located a short flight from the UK, Palma hosts a number of different events across the city, providing an exceptional New Years’ experience for visitors surrounded by twinkling lights and live entertainment. One of the celebrations is a spectacular party that takes place on the central Placa de Cort, with the traditional bells ringing at midnight, accompanied by light shows projected onto the surrounding historical buildings and dancers that weave their way through the crowds. The Passeig des Born will also host a number of live concerts throughout the evening and is a prime location for visitors to watch the fireworks over Palma’s marina after midnight. Stay at the luxurious five-star boutique hotel Can Cera offering the ideal location from which to enjoy New Year’s Eve celebrations in the city. Located in a traditional 17th century Mallorcan palace, the Can Cera offers modern and spacious rooms perfect for those wanting to escape the hustle and bustle of everyday life and enjoy a relaxing stay in an oasis of tranquillity. Double rooms are available from £290 per night based on two people sharing.